Since the passing of the Housing, Town Planning, etc, Act, 1909, there have been published a considerable number of books and a vast number of pamphlets and magazine articles dealing with the subject of Town Planning. There has, however, been produced nothing that can be described as a text-book for the student." 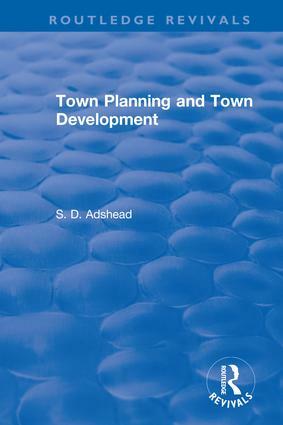 A detailed study, including the sociological basis of town planning, traffic requirments & roads, zoning, town planning, municipal planning, and early housing acts, later acts, and more."